2. Fry the mustard seeds and bengal gram dal till the seeds start to splutter. 3. Add ginger, green chilli and onions. 5. Add breadcrumbs, potatoes and salt. 6. Mix well and remove. Keep aside. 7. Add water to gram flour and mix to a batter of pouring consistency. 8. Make small balls of the prepared mixture and dip them in the batter. 9. Heat oil for deep frying. 10. Fry the prepared bondas until golden brown. 12. Serve hot with chutney of choice. 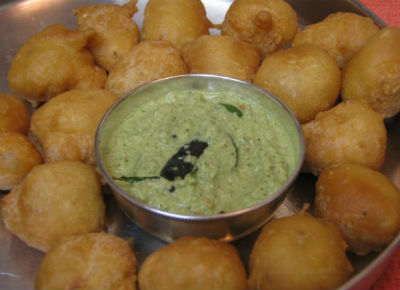 Feel free to comment or share your thoughts on this Bread Bonda Recipe from Awesome Cuisine.